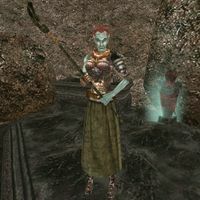 Zula is a Dunmer dreamer, who can be found in the Sixth House stronghold of Mamaea. She is notable for being the only Dreamer who actually has a name. While most Dreamers walk around near-naked, Zula wears a netch leather cuirass with matching left pauldron, right gauntlet, and pair of boots along with a common skirt. She carries a crude bronze key, a medium corprusmeat hunk, and a wooden staff. Aside from her natural resistance to fire and the sanctuary provided by her ancestors, she knows no spells. Zula also appears in Legends. This page was last modified on 15 November 2018, at 07:12.